I left work at 11:00am on Friday, finished loading up the Jeep and made my way east on I-70 to the Front Range. 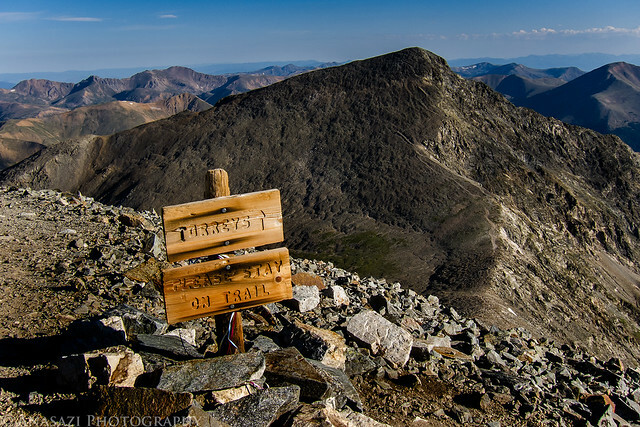 One of my personal goals for the year was to hike to the top of three 14ers, so I decided to try and hike the Grays Peak and Torreys Peak combo to knock two more off of my list. 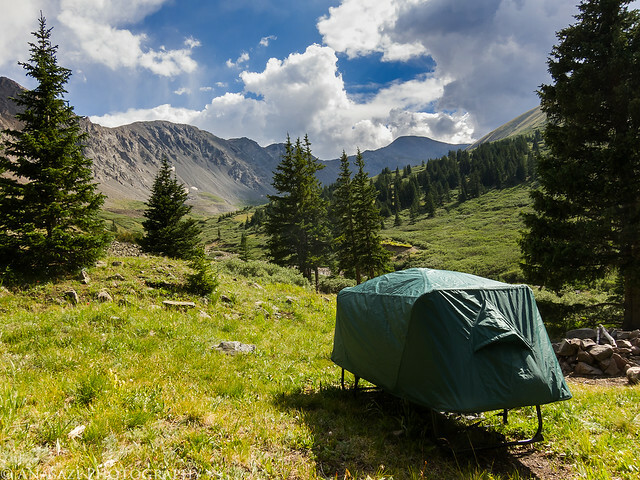 I made it to the Stevens Gulch trailhead around 3:00pm and found a nice campsite nearby. Had I arrived later in the evening, I doubt I would have been able to find a nice campsite right near the trail. There were a few sprinkles of rain in the afternoon, but they only lasted for a short time. I spent much of the evening reading and relaxing. The sky stayed overcast until I went to bed around 9:00pm, so I didn’t even bother taking any photos around sunset. My campsite with a nice view in Stevens Gulch. Grays Peak is visible in the distance. My alarm woke me up bright and early at 4:00am on Saturday morning. After having a quick breakfast of oatmeal and getting my pack ready for the hike, I was on the trail at 4:30. I started the hike up Stevens Gulch under a canopy of stars with the silhouettes of the surrounding mountains just barely visible. There were a few other people on the trail at this time, but they were pretty far ahead of me, so I was by myself for a while. It was nice, especially since I knew the trail would be packed full of people in a few short hours. The stars soon faded as the dawn light arrived. 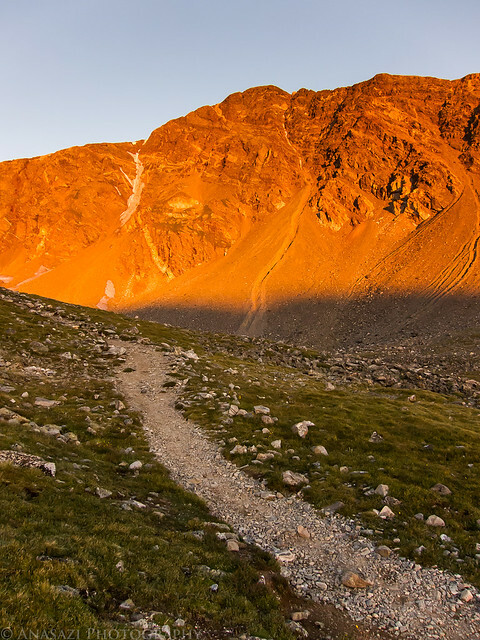 As I was nearing the base of Grays and Torreys I was treated to the first light of the day striking both peaks as the sun was just rising in the east. 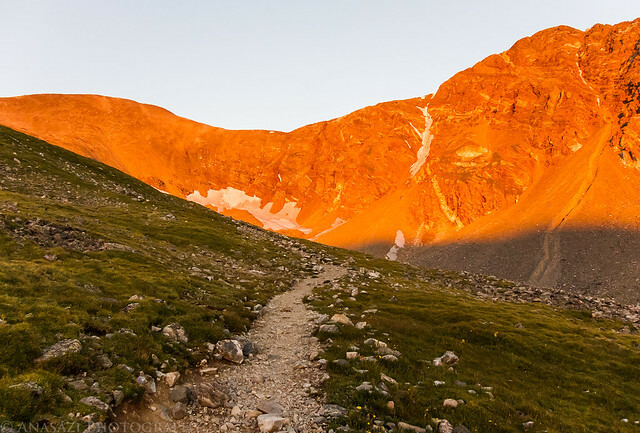 I took a few photos of the peaks glowing orange before starting my climb up to the top of Grays Peak. Just as the sun started to rise, it gave Torreys Peak a purplish glow for less than a minute. Luckily my camera was handy. Then the mountains in front of me were bathed in amazing warm light. It was an incredible sight and made me wish I had dragged my heavy DSLR along with me. The mountain lit up in this photo is Torreys Peak. Here’s a view with Grays Peak on the left and Torreys Peak on the right. 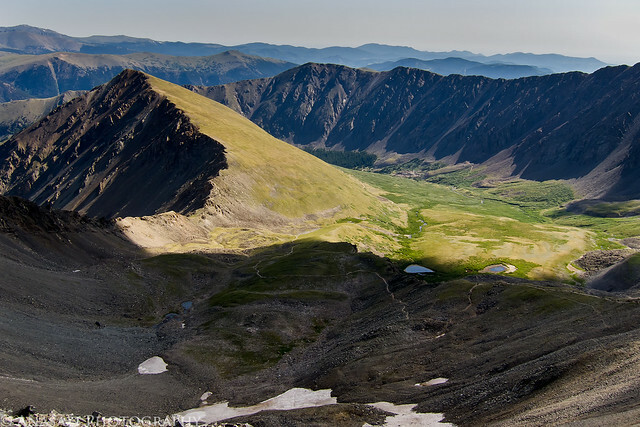 The angle and location of this photo makes Torreys look much higher, but Grays is actually three feet taller. 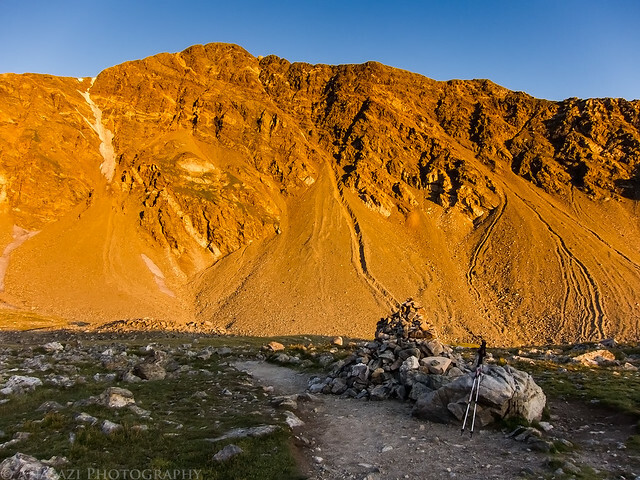 Another view of Torreys Peak from further along the trail as the warm light has started to fade. 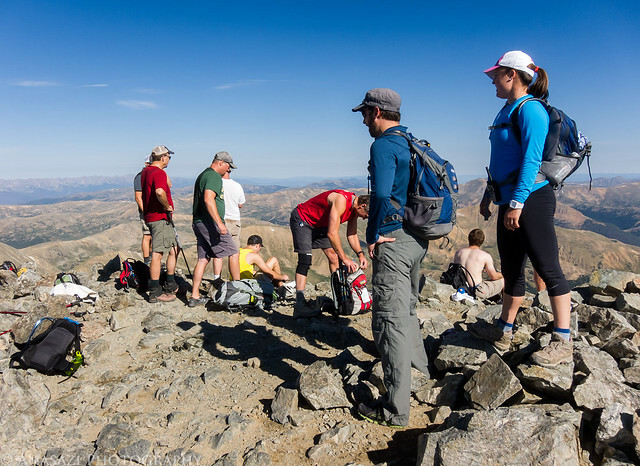 When I reached the summit of Grays Peak there were only 4 others up there, which was nice since I would notice later in the day that were a lot more people up there. 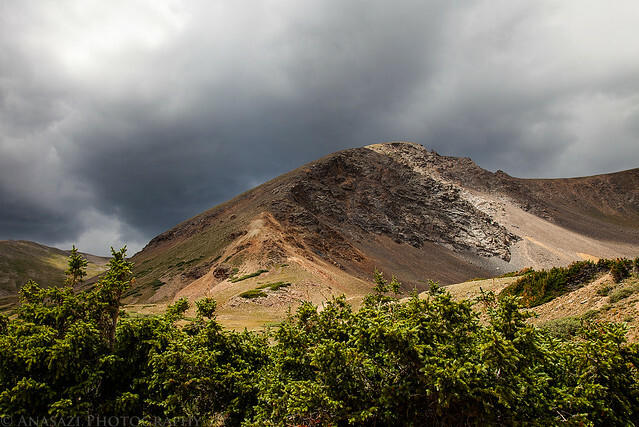 Grays Peak, at 14,270 feet, is the highest point on the Continental Divide in the United States and is also the highest mountain in the Front Range. There were only four people on the summit of Grays Peak when I arrived. As I hiked down later, I would look up here and see a much larger crowd. 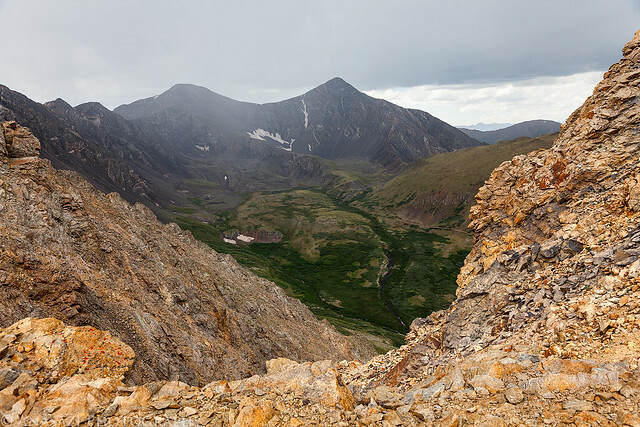 The view from Grays summit over Chihuahua Gulch and Ruby Mountain towards Peru Creek. 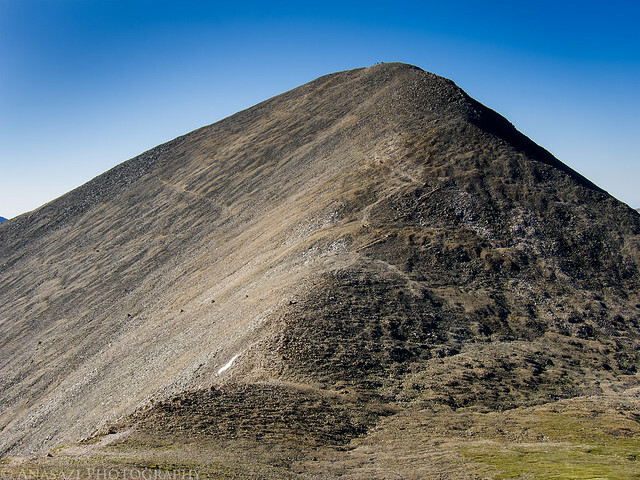 Just past the summit is the trail to Torreys Peak. 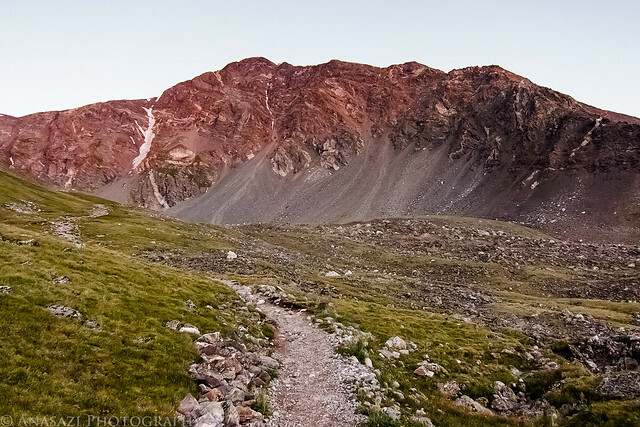 The trail drops down about 600 feet to the saddle between the two peaks before ascending Torreys. If you look closely you can see the trail that follows near the ridge. 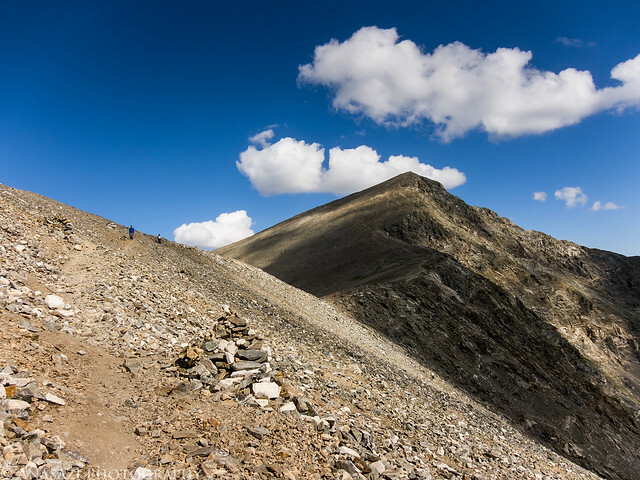 After making the descent to the saddle, I had to climb back up the elevation I just lost to reach the 14,267 foot summit of Torreys Peak. I made it up to the top of Torreys in just under an hour. I took a few photos and had a quick snack before starting my hike back down to my Jeep at the trailhead. When I reached the lowest point of the saddle between the two peaks, I turned around and took this photo of Grays. You can see the trail I had just descended on the right, plus the trail that switch-backed up the face of the mountain on the left. 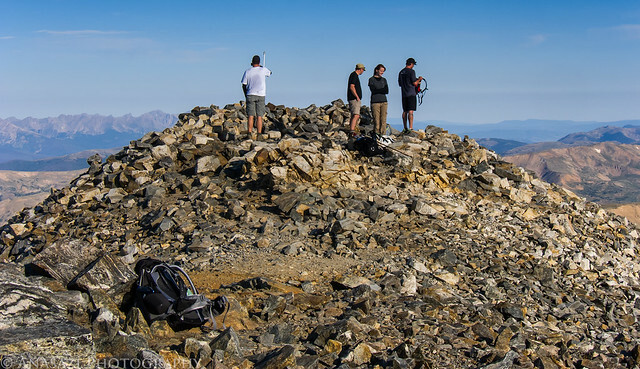 When I reached the summit of Torreys Peak, there were a few more people up here than there were on Grays. The view down into Stevens Gulch. You can see the hiking trail snaking it’s way up the gulch. Kelso Mountain is the prominent peak on the left. 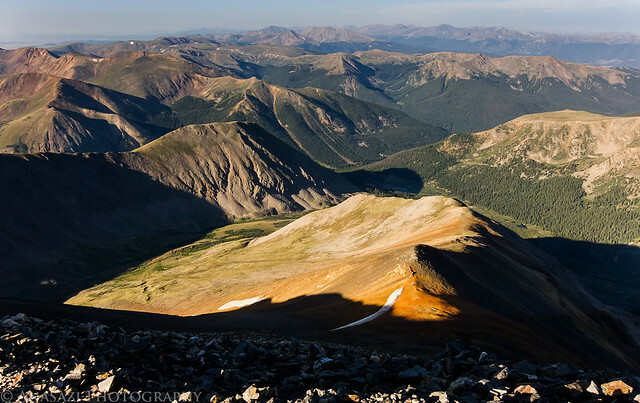 The view back toward Torreys Peak as I hike back down. 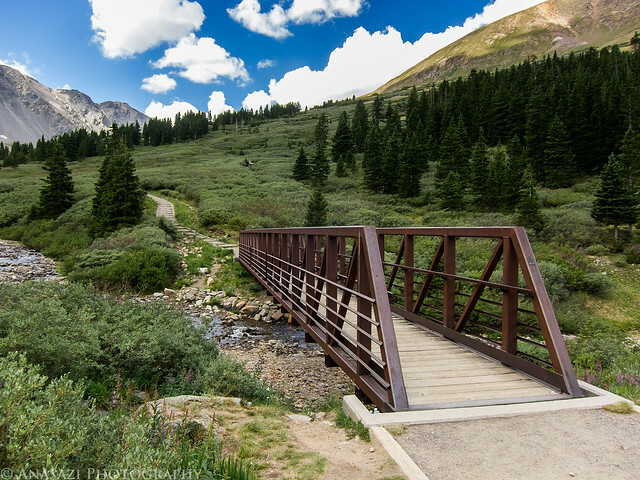 Just a photo of the bridge near the trailhead. It was dark out when I was here in the morning, so I took a photo on my way back. I could not believe how many people were hiking up the trail as I hiked back down. It seemed like there was a constant stream of people, and I am very glad that I got a very early start and did not run into many people on my way up. After I packed up my campsite I started driving down the Stevens Gulch Road back to the Interstate. Cars lined both sides of the road, which would have made it very difficult to pass oncoming traffic if I had run into any. I was pretty hungry at this point, so I stopped in Georgetown for some lunch before driving up the Waldorf Road to the top of the 13,117 foot McClellan Mountain. When I reached the top I was treated to a different view down into Stevens Gulch and across the way to Grays and Torreys. The clouds roll in as I drive up to the top of McClellan Mountain. 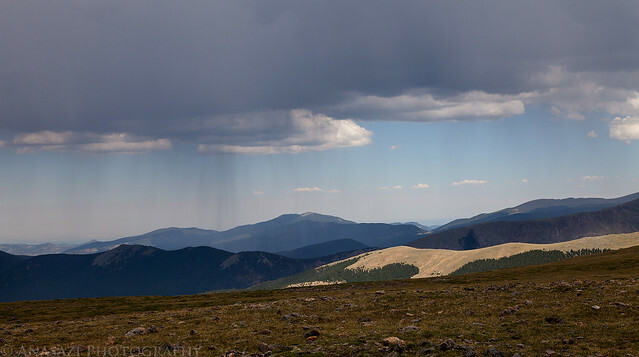 A different view of Grays and Torreys from the top of McClellan Mountain. Up until this point a few dark clouds had started to fill the sky, but there had been no rain, lightning or thunder. As I was taking photos from the top, all of a sudden I started to hear some electrical/static popping sounds from the rocks around me and the hair on my arms started to stand up. I knew it was time to get out of there as quickly as I could. Luckily my Jeep was only about 50 feet away, so I quickly ran back there and got inside. That’s when the wind picked up and the rain, hail and even a little snow started to fall. The lightning and thunder started, too. Rain in the distance as I drive back down from McClellan Mountain. 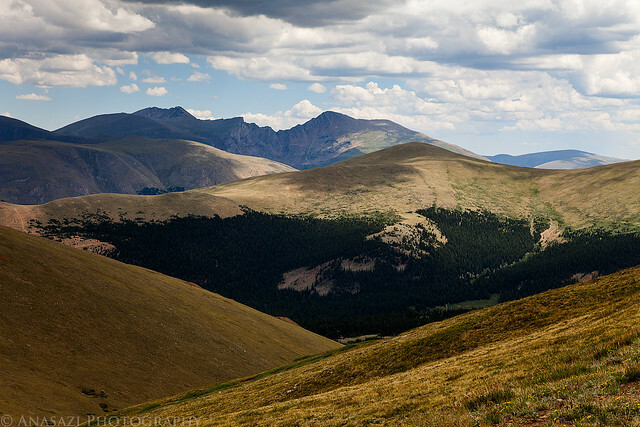 Dappled light leads the way to Mount Evans, The Sawtooth, and Mount Bierstadt in the Mount Evans Wilderness area. I had wanted to drive up to Argentine Pass a few years back, but it was closed because of construction on Guanella Pass Road at the time, so I figured I would drive up there quickly today, since I was in the area. From the pass I was treated to yet another different view of Grays and Torreys Peaks, plus down into Horseshoe Basin and Peru Creek. 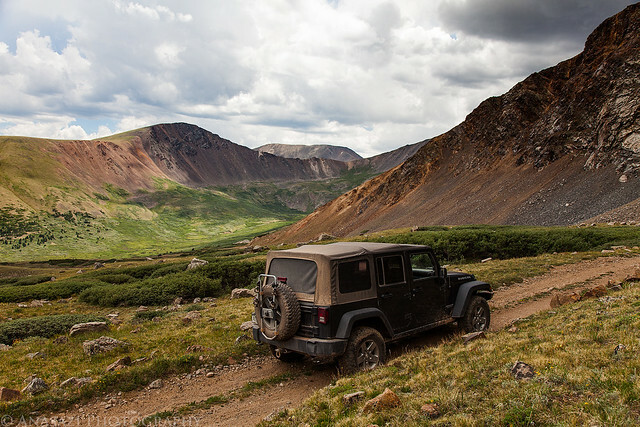 At 13,205 feet, Argentine Pass is the highest named vehicle-accessible pass in the state, but because of rock slides on the other side, you cannot actually drive over the pass any longer, just up to the top and back down the way you came. I had a few minutes at the top with no rain, but then it started to come down again while I was up there, this time heavier than before. 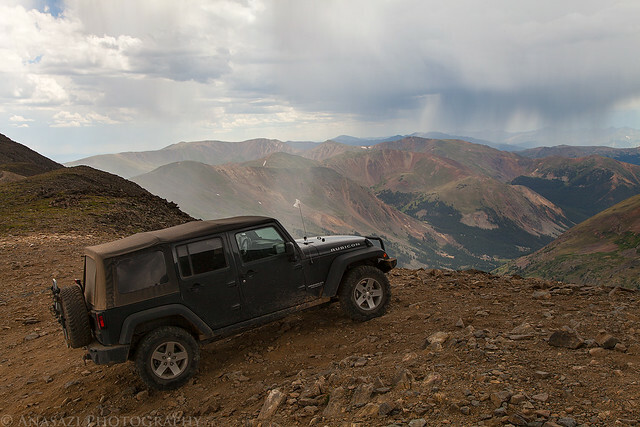 Rain over Peru Creek below with my Jeep parked at Argentine Pass. After taking this photo, I turned around and drove back down in the rain. The rain would pretty much not stop again for the rest of the day. When I reached the Guanella Pass Road I took a right and drove over Guanella Pass and then circled back around to Breckenridge via Boreas Pass. When I had cell signal again I checked the weather map and saw that most of Colorado’s high country was getting heavy rain and that it probably wasn’t going to stop for a while. With that forecast I decided to call it a weekend and drove home a day early. I had already accomplished everything I wanted to do this weekend and had no real plans for Sunday anyway, so it would be nice to take a day off and just relax at home.